Targeted removal of threat at a story for 1, fairly easy to trigger with the likes of Deranged Diva, recursive with Patron of the Arts (Madness). 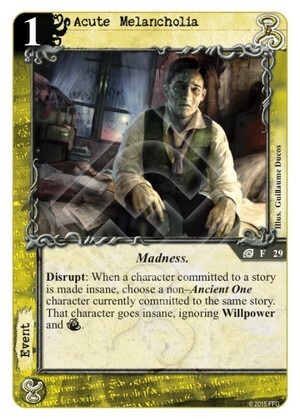 This card alone goes a long way to addressing the deficit caused by Hastur's dependence on the Terror struggle. Agreed, although I wish it were a Response instead of a Disrupt. If it were a Response, and if you had a Patron of the Arts on the board, you could commit, drive your committed guy insane with the Patron, fetch AM with the Patron, then play the same AM on your opponent's guy, all in sequence. Because it's a Disrupt instead of a Response though, you can't play the same AM that you're fetching. It's still really good though.